Hey! Hello! 's self-titled LP is currently sitting at number 12 - and is outselling multi-platinum acts such as Daft Punk and Justin Timberlake. Currently heading the album chart is X Factor runner-up Jahmene Douglas' debut effort, Love Never Fails. He is trailed by Robin Thicke at number two while Jay Z, Passenger and Selena Gomez complete the top five. In the singles chart, Avicii is in the midweek top spot with Wake Me Up - pipping boyband One Direction's Best Song Ever. But Hey! Hello! 's barbed-wire blend of pop anthems, that has seen them described as "Abba meets Green Day", appears to have struck a chord with rock fans - despite the group not having big-bucks record label backing to promote their efforts. 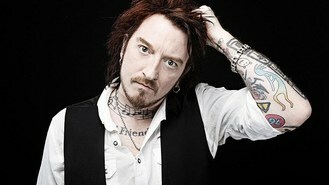 The Anglo-American duo is the brainchild of New York singer Victoria Liedtke and prolific Geordie songwriter Ginger Wildheart. Scott Rowley, editor-in-chief of monthly magazine Classic Rock, said many have been pleasantly taken aback by Hey! Hello! 's sudden rise. He said: "There's a great irony in the fact that the industry is being shaken up by a guy like Ginger - a great songwriter who's probably been discounted as a lost cause by record labels and too old by the weekly music press. "Yet here he is, raising money via Pledge Music, with four or five projects on the go at once, and busting into the charts with no hype, no ad budget, just a great record." Late last year, Hey! Hello! released a teaser track, How I Survived The Punk Wars, which was championed by none other than Guns N' Roses bass player Duff Mckagan. The live action lyric video offers advice to budding musicians in brutally honest fashion - as well as hammering home the message about doing things your own way. Mckagan said: "It's perhaps the best and most real punk rock song in a long, long time. It actually stunned me." And the song's independent spirit sparked further interest in the band's debut release - with thousands of fans paying upfront for an LP on the strength of one song alone via the crowd-sourcing website PledgeMusic. Word of mouth on the duo has continued to spread, and seen them embark on recent promotional tours of US and Japan. Oklahoma-raised Victoria said: "Ginger and I just wanted to make a fun pop album. We didn't wanna overthink things musically or get too ahead of ourselves in terms of the band's career trajectory. "We just wanted to make music that made us smile and bop our heads. "It's just bonus points at this point seeing everybody else joining in with the smiling and bopping. "I never thought for a second, Hey! Hello! would be embraced like this. It's been amazing."